Is Your Victorian or Edwardian Property in need of Bowed Wall Repairs in or around London? Bowed or bowing walls are a common defect on period properties due to inadequate degree of horizontal restraint between the external walls and the floor structure, causing the need for Bowed Wall Repairs. A wall being out of alignment is a common defect with high walls of older properties. In modern houses there is a physical connection between floor joists and roof joists using proprietary galvanised metal straps built into the wall and fixed to the joists at floor and roof level. However in period properties there was no such a requirement. Where the joist span perpendicular to the wall and bear into the wall there is a limited degree of restraint due to the friction between the built in joists and the wall surface but this can deteriorate over time. Where the joists span parallel to the wall there is no lateral restraint offered to the wall, usually the side gable wall and this is where bowing usually occurs. This is one of our recent projects where we carried out Bowed Wall Repairs to an Edwardian property in the heart of North London. 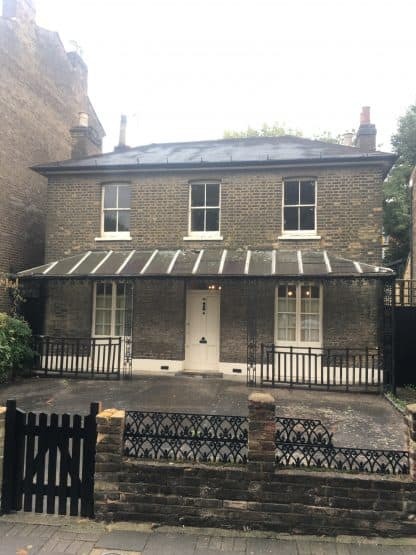 The property which was going to be refurbished inside and out was bowing outwards on the front, back and one of the side elevations, so the order of the works was to carry out the Bowed Wall Repairs first to restore the structural integrity. London Structural Repairs had our surveyor carry out a detailed structural survey to the property and then designed the repair strategy to fix this common defect. LSR skilled staff Installed Lateral Restraint Ties through the solid walls and into the floor joists on the three elevation walls. We also fixed the Lateral Ties to the internal stud partition walls and Cemties-Grour ties to a solid internal wall.